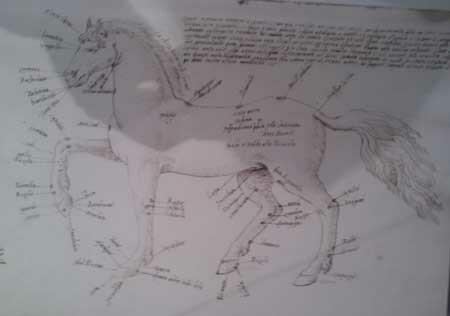 The scarcity of reference material on antique saddlery and lorinery can be frustrating. Old catalogues from any era can be fascinating sources of information – but this one is special. 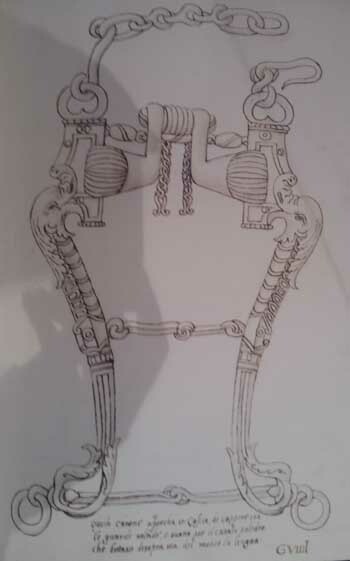 It is in the prints and books collection of the Victoria & Albert museum. 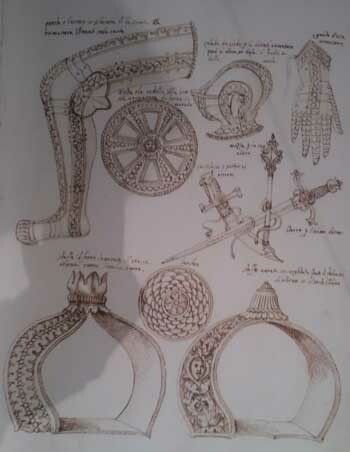 The original can be seen by appointment, it is an album of 306 illustrations by Filippo Orsoni of Mantua. The museum has put a reproduction copy on display in its new Medieval & Renaisance galleries – I took these photos there (not great quality, but the museum has MUCH better images of it here. Only a few pages have been reproduced, it would be fantastic if they could publish a commercial version of the whole thing. One of the pages in the book is helpfully dated 1554. Many of the designs show armour and costumes for parades – the one on the left could, conceivably have been used at a tournament or on the battlefield. 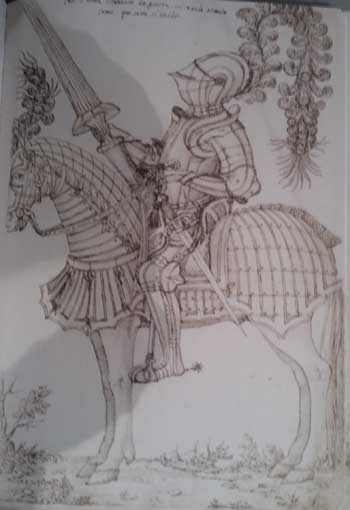 The writing at the top of the page is translated by the V & A to read “This is how the war rider is armed, with his horse armed as visible here”. I find the protective cage stirrups interesting. 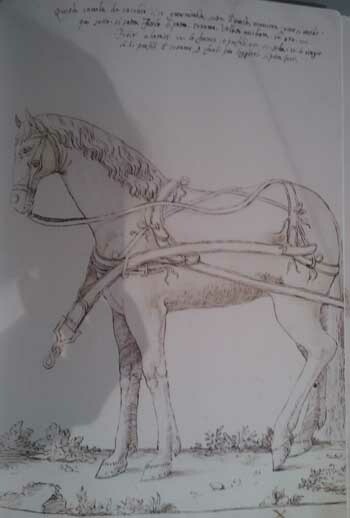 Also note the long neck of the spur, the theory goes that this enabled the spur to reach up under the bardings or caparison of the horse. This is described as a Turkish costume for a pageant. Orsoni offers prospective buyers a choice of red or other coloured silks for the harness coverings and the option of gilded weapons. 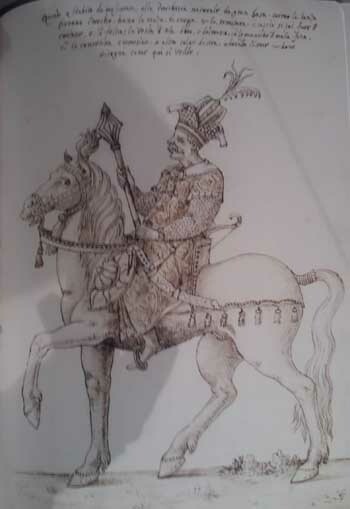 Central and eastern europe were famous for their horsemen, the term “Hussar” probably originated in Hungary (or possibly Serbia). 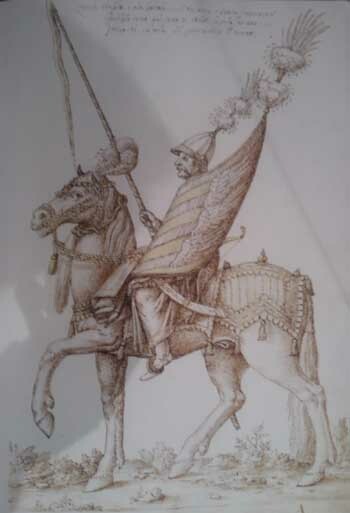 This image does call to mind the Polish Winged Hussars. I can’t quite work this one out, I can see a breastcollar, but no surcingle or roller, and are those straps or shafts behind ? Also is that something for coupling the harness in front – is this a tandem arrangement? “This type of bit, curved as a pitchfork, shaped as capon’s legs…” – the capon-legged bit, a missed marketing opportunity? Although this bit looks really severe, I believe they were supposed to be used in a similar way to western spade bits, the rider keeping a very loose rein. 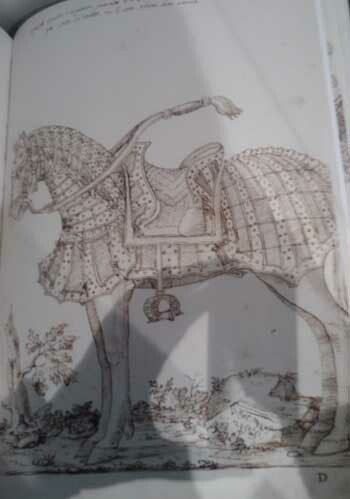 This entry was posted in Horse Bits, Military horse, Stirrups, Uncategorized and tagged 16th century, book, medieval, museum, renaissance. Bookmark the permalink.